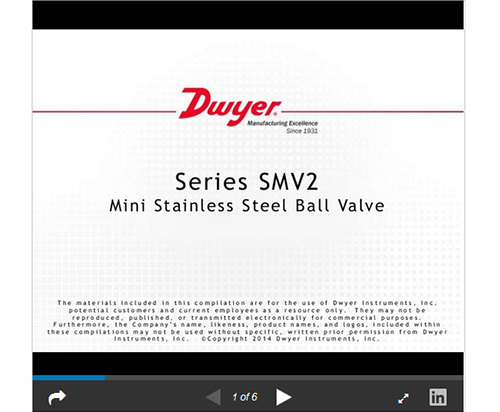 The Series SMV2 Mini Stainless Steel Ball Valve is ideal for small, confined spaces, where larger valves are unsuitable. The 316SS and PTFE wetted materials are excellent for applications with corrosive media. The handles are made of a rigid nylon for extended durability. Installation is made easy with a choice of FxF or MxF process connections. 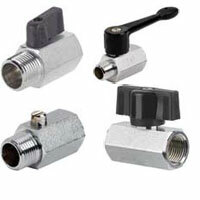 PTFE ball seats provide broad media compatibility and bubble tight shutoff. NPT, see model chart on catalog page. 1/8 " to 3/8", 1000 psi (68.9 bar) WOG; 1/2", 800 psi (51.1 bar) WOG. Valve Body: Cast 316 SS (CF8M); Valve Ball, Insert and Stem: 316 SS; Ball Seat: PTFE.